Continuing a truly remarkable string of fantastic releases of late, Sweden's PNKSLM label is set to drop the debut EP from fellow countrymen (and women) Hater later this week. The EP, entitled Radius, showcases the rich indie stylings of this relatively new four-piece. Opener "First Time" purrs and unwinds like some strange hybrid of Mazzy Star and Bettie Serveert, while the peppier "Plain Clothes Darling" adds a hint of a Pavement-like shuffle to things even as the vocals of Caroline Landahl soar and trill. The final cut on this EP, the title song "Radius", uses a jaunty guitar figure to counter Caroline's vocals for an effect not unlike early Breeders cuts, or those Pixies numbers where Kim Deal took over on the singing. The band adds a new shade to the sonic palette of the PNKSLM label and it's a beautiful and affecting one. Radius is an all-too-brief taste of the music of Hater. Caroline Lindahl, Måns Leonartsson, Adam Agace, and Lukas Thomasson formed this band this year and if they are this good already, I can only imagine what the debut full-length record, being recorded now, will sound like when it's released. Follow Hater via the band's official Facebook page and, as always, check in on the official PNKSLM website for more on Hater and the other fine bands on the label's roster. This New Skytone Single Is Superb! 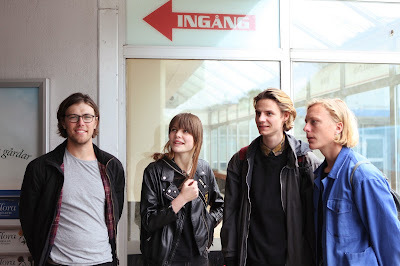 Heads Up About The New Joanna Gruesome Single!